What clay to buy? Oven baked or Air Dry Clay? Do you use oven baked or air dry clay? I have received many questions like this from you. Alright! We know you can't wait to make your own clay model. And.... you need clay, don't you? But, you may not have time or experience to make your own clay. So, you'll buy the clay, right? I am sure you will ask yourself, what clay to buy? where to buy? Well, before you hit the button to buy clay online or going to your local craft store, you may want to read through my review first for your reference and quick guide. Well, what clay to buy? The "clay" we are referring here is not the clay minerals that naturally formed from the rock through chemical weathering. We use clay craft such as polymer clay which required baking to make it hard and air-dry clay, a type of clay that will dry in room temperature without baking. Polymer clay is a modeling clay with polymer polyvinyl chloride (PVC) base. It will stay soft in room temperature (uncured) and hardened when baked in the oven at temperature as recommended by the manufacturer. There is an interesting story behind this clay. It was said that the Polymer Clays were initially formulated to replace "Bakelite" which was contained flammable phenol base. The new formula was given to a daughter of a German doll maker in 1939, Sophie as a modeling clay. She was fondly known as "Fifi". The clay was favorable as modeling material at that time and it was marketed under "FIMO" (Fifi's Modeling compound) brand by Eberhardt Faber later on. Another famous brand is Sculpey. Wide varieties of color choice from pastel to bright colors. Special effect like mother pearl, metallic, granite, etc. Close supervision needed at all time when baking the clay (only suitable for kids above 8 years old). The end result may vary depends on your baking time and thickness or shape of the model. Need special products (compatible) for glue, surface finishing, etc. More expensive compared to air drying clay. Many people referring air dry clay as a new form of clay. Even some of them make the clay sounds trendy by calling it ADC Clay. Basically, the clay will dry out in room temperature within 24 hours or few days depends on weather in your home country, size and thickness of the model. I did all my clay models - all sizes with my own ADC clay. I love the material so much. If you want to make your own clay you can check out my modeling clay recipes. But if you are not sure about it I would like to suggest you to buy ready-made air dry clay. Easy to handle, suitable for all ages from toddler to grandparent. No special products required for glue and finishing. Cheaper and yet look professional. The clay will shrink about 5-15% after it's dry. Need longer time to complete bigger size model. Inconsistent result even though you use measurement every time you make the clay. So, what clay to buy? For soft, light and squishy air dry clay : Crayola, Amaco cloud clay or other type soft clay like those from Korea. The two brands mentioned are highly recommended for small kids. It's easy to handle the clay, no-mess and non-toxic. Crayola Model Clay Class pack in white and Crayola Classpack Assorted color are ideal for teaching clay art to a group of kids from 2 years old and above. However, based on my own experience, I would say Crayola squishy clay is more brittle than the Cloud clay. Cloud clay will stretch better and dry harder than the Crayola. But again, both is good for kids. The best air dry clay for making flower is Hearty Clay Super Light-weight from Japan or Martha Stewart clay. You can buy Martha Stewart Crafts Crafter's Clay, White as a start for about $10.00 I think (not sure if the price changed by now). Sometimes it comes with 45% discount which will cost you about $5.99/ pack. If you are looking for air dry clay that will dry hard, Makin's clay is my favorite. I used Makin's air dry clay for my figurines and miniatures . It has similar quality with oven-baked polymer clay after it's dry completely but easier to handle. 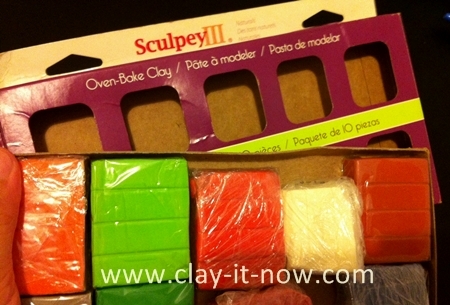 As for oven-baked clay, you might consider buying Sculpey or FIMO clay. Some of you have asked me what clay to buy if you want it air dry or curing in microwave. Well, If you are looking for clay that will dry in room temperature or hardened in microwave oven, FIMO Air Light would be your choice. This type of clay is good because when you change your design half-way through the clay still wet and when you are sure about it, put the clay model in microwave oven and it will hardened in minutes. We hope that you've found the answer about what clay to buy in this page. You can use search button below to find clay you like.